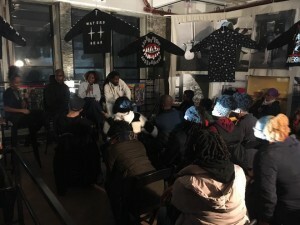 In a two-part evening, curated around the experiences of Haitian Diaspora in Flatbush, Plantin engaged audiences in a panel discussion between Caribbean creatives highlighting how their heritage influences their work, and in an exhibition of narrative wearable art that she developed in partnership with Haitian artisans. 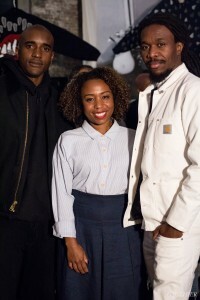 Panelists Travis Gumbs (Co-Founder of creative agency Street Ettiquette and publication Maroon World), Nicole Plantin (VP of A&R for LA based independent label, Rostrum Records) and Saint Louis (Brand Strategist and Co-Founder of GFCnewyork) each talked about how they express themselves, their culture and what PWOTEKSYON means to them. View photos by Liz Gauthier from the event by clicking here. Some highlights from Jasmine Plantin’s ( @aammppppp ) #PWOTEKSYON Panel & Exhibition of jackets she designed. We had very little time for install but we got it all up & looking good! Thank u to @laurelgolio for event photos! This entry was posted on Tuesday, November 14th, 2017 at 5:28 pm	and is filed under Archive, Fashion, HCX Programs, Lakou NOU, Uncategorized. You can follow any responses to this entry through the RSS 2.0 feed. You can leave a response, or trackback from your own site.